It’s still the season for British asparagus (and yes, I believe it’s running slightly late this year, along with much of nature). Today we used up some local asparagus spears to accompany a homemade ravioli filled with a mix of black salsify, hazelnuts and ricotta. It’s a variation on a theme by our old favourite Denis Cotter, with a few ingredients changed, and it was rather delicious. I’ll write up more about homemade pasta soon but in the meantime, here’s what we did for this dish. First, the ravioli filling: preheat the oven to 180c. Peel and dice around 100g of black salsify and boil in a small saucepan until tender. Scatter the salsify on an oven tray and place it in the warm oven to ‘dry out’ a little for around 10 minutes (you don’t want a soggy filling in your ravioli). After removing it, mash it with a fork. Leave the oven on. Blitz 25g of hazelnuts in a food processor and transfer to a bowl, mix in the salsify mash, a large dessert spoon of ricotta, a large pinch of grated or ground nutmeg, season with a little salt and pepper and combine well. Set aside. Now for a little ‘sauce’: squeeze the juice of half a lemon into a small pan, add some strips of lemon peel and 50ml of white wine plus a pinch of saffron strands. Bring to a simmer and let it cook for 3 minutes. Remove the strips of peel and add around 30g of unsalted butter. Stir until it melts. Keep this warm, but don’t let it boil. Filling the pasta: a general way of making the ravioli is with two equal size sheets of thinly rolled pasta dough. Take the first and carefully place teaspoons of the filling on it, around 2.5cm apart. Brush the pasta with water or egg wash and place the other sheet on top. Press it down, making sure there are no air bubbles. Now use a ravioli cutter or knife to cut out square ravioli. The asparagus: we used thick spears, woody ends snapped off, cut lengthways. Thinner ones can be left whole. The tomatoes: slice a handful of cherry tomatoes in half and place them on an oven tray, drizzle with olive oil, season with a little salt and place in the oven. Now bring it all together. First put the asparagus in a saucepan of boiling water and simmer for around 5 minutes until just tender. As it’s cooking, cook the ravioli for around 4 minutes in a large pan of salted water. Drain, return to the pan and add the lemon butter. Stir. 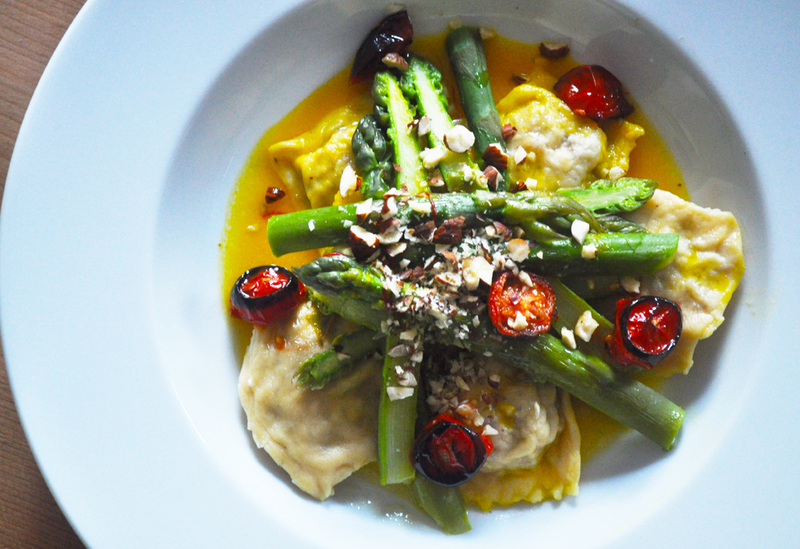 To serve, place the ravioli in wide bowls, place the asparagus on top, pour over any remaining lemon butter, add the tomatoes and finish with a scattering of chopped hazelnuts. Until recently there hasn’t been much summer round these parts, which means we haven’t done what we usually do with our dinners at this time of year. But… the sun has started making occasional appearances and thoughts have turned to lighter meals that make the most of delicate summer flavours and fragrances. And bruschetta – we haven’t made bruschetta in, well, ages. Certainly not since we moved from London last year. Bruschetta. Stuff on toast. Wild mushrooms and thyme; roasted cherry tomatoes, mozzarella and basil; sweet roasted peppers with chilli and parmesan; chargrilled aubergine, ricotta and pesto… all with a good hunk of lightly toasted bread, rubbed with garlic and drizzled with a good olive oil. Yum. We had none of the variations above on this occasion. What we had was half a loaf of bread from the Village Deli in Wivenhoe (they do good bread, I try not to look at it as I pass – I’d eat little else), plus a few leftovers from our weekly veg box and recent trips to the supermarket. Which meant we had courgettes, beetroot, broad beans, a green pepper, some grilled globe artichoke hearts, a mild red chilli – and a nice block of crumbly-ish, creamy goat’s cheese (again, from the aforementioned Deli). The only method with this is to treat each ingredient with respect: so, the peppers and beet are roasted separately, in a little olive oil, and chopped into chunks; the chilli goes with the pepper and is then sliced; courgettes get sliced and cooked on a griddle; broad beans are shelled, blanched for 4 minutes and slipped from their pithy skins; artichokes, already cooked, are ready to go. 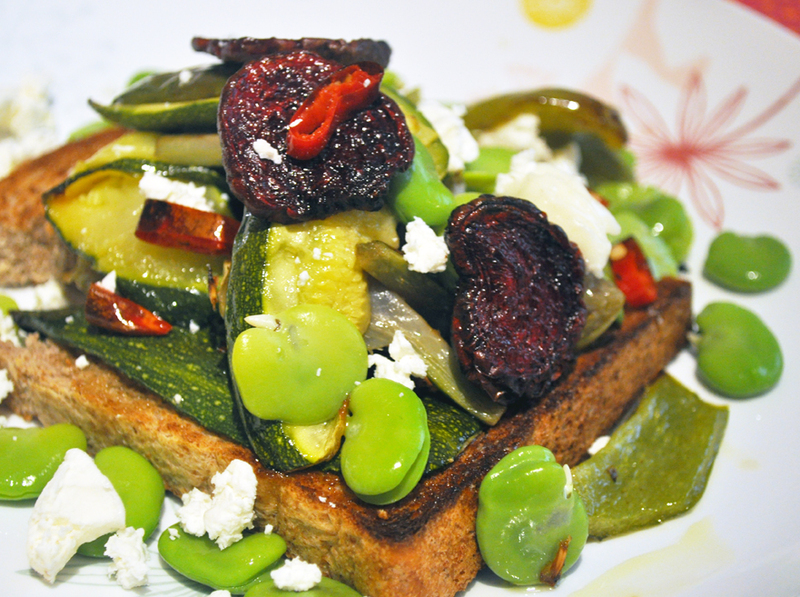 When it’s all done, toast the bread, rub it with garlic while it’s still hot, and pile up the veg on top, attractively if possible, interspersed with the broken-up goat’s cheese. And then drizzle with a little olive oil. Does bruschetta really require a recipe? I don’t know: it’s just toast with stuff on it. Nice stuff though. And nice toast. And a nice, light, summer’s evening meal. It’s such a cold day here in the south east, as I’m sure it is elsewhere in Britain today. East London was perishing at lunchtime and when I got back to Wivenhoe, old puddles at the side of the road hadn’t thawed. The perfect day, then, for a chunky bowl of Italian peasant food. A classic Ribollita is a heartwarming soup of vegetables, beans and bread – used to thicken the soup to an almost stew-like consistency. Everyone will have their own favourite way to make it, but I do like this one from Jamie Oliver. And he’s right, it’ll taste even better tomorrow. Do you ever start to make a recipe and then realise you’re missing a vital ingredient? Only the other day I was busy assembling a meal of (Turkish vegetable casserole) Turlu Turlu when I remembered I had no tomatoes in the house in any shape or form. Which reminds me that ETP should feature that recipe at some point. Well, this risotto recipe may look complete, but secreted within it is a similar story. It was meant to include elements of fennel (in the oil) and broad beans (adding colour and texture to the risotto). Oh dear. I can feel our old friend Denis Cotter, whose recipe we were stealing, shaking his head admonishingly. The lemon oil was made by shaking olive oil with the zest and juice of a lemon in a jar. Easy – in effect a basic lemony dressing. Beets are then boiled/simmered until tender (anywhere between 20-40 minutes, depending on size), drained, rinsed under cold water then peeled. They are then diced and roasted with a little olive oil and salt for 15 minutes. Don’t burn them – it’s easily done. After 15 minutes, remove half the beets and, adding about a cup-full of vegetable stock or water, blend to a puree in a food processor and put it in a pan on the hob, adding enough extra stock to make the amount of risotto you’re cooking. Keep the stock hot. Continue to cook the remainder of the beets in the oven for 10 more minutes or so, until they begin to caramelise. Now for the rice – and this really just becomes a standard risotto cooking method with a different type of stock. So, saute a couple of finely sliced shallots and 2 cloves of garlic in a little olive oil for 5 minutes. Add arborio risotto rice and ‘toast’ it in the pan for 5 minutes, stirring often. Add a small glass or red wine and cook for a further 5 minutes or so to ‘burn off’ the alcohol. Then start to add the beetroot stock, a ladle at a time. Keep going until the risotto is just tender. It should be pink too! When it’s done, stir in the caramelised beets and a little butter. 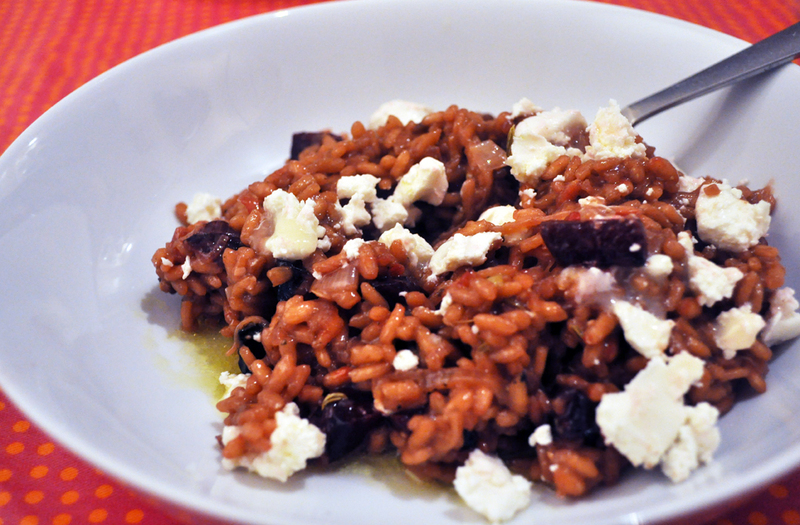 To serve, plate up the rice, scatter over some goats cheese and drizzle the lemon oil over. Even if it wasn’t the recipe we had initially intended, it still worked – big flavours all round, from sweet beets to tangy goats cheese to perfumed lemon. The prize goes to the best colour pink, along with the biggest flavours. The photo here doesn’t quite do ours justice – but I think another bash at the recipe could improve it. A magenta risotto, anyone? Before we made this, a couple of months ago, I think I had eaten polenta about twice in my life. Each time it was bland and distinctly, well, horrible. I never wanted to go near t again. I’d see it on a menu and think “Ha, well they’re trying to be clever, but it won’t work,” or see it cooked on TV and think “They’re gonna taste it and say it’s nice, but they’ll be lying”. Polenta. Italian peasant food. But I kept on seeing it and some of my favourite cooks feature a polenta recipe every time they release a new recipe book. So what was my problem? Well, blandness and texture were the big things and, fortunately, they could be sorted. 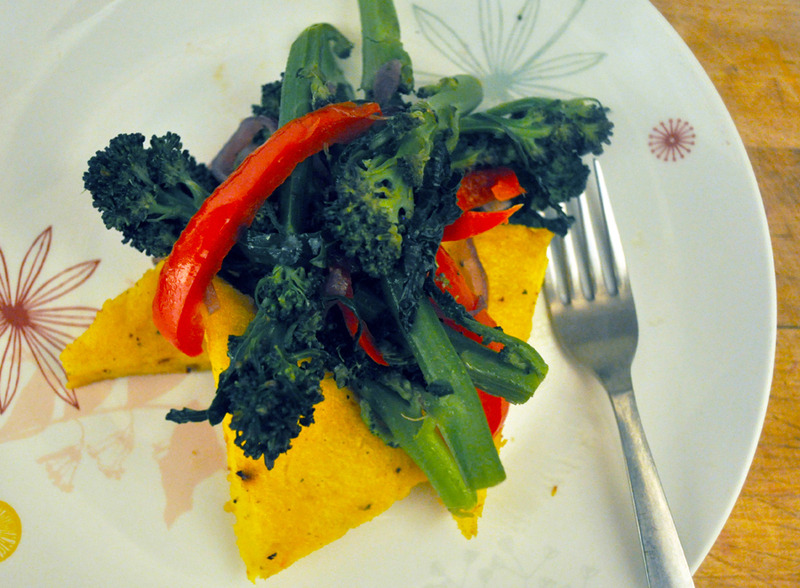 I wanted a polenta that was rich with flavour and didn’t feel like gritty mush in the mouth. Actually, it’s easy to achieve and, typing this up, I’d like some more of it now. We cooked 250 grams of ‘coarse maize’ polenta in around a litre of simmering vegetable stock until it was soft, stirring regularly. I think that took about 20 minutes (to remove the granularity) but I could be wrong – so keep checking. We then stirred in some chopped birds eye chillis and a handful of grated parmesan/pecorino cheese, gave it a good mix and spread into an oiled shallow baked tray. After about 20 minutes, the polenta is cool and set firm. We could then cut it into triangles and grill/griddle it. This would work well on a barbecue, though it’s too chilly to be thinking about that at the moment. We served our polenta wedges with greens and peppers – thinking of it as the carb on the plate in place of potato, pasta or rice. And it was really tasty. Honest. Consider me converted.